Orthognathic surgery is needed when jaws don't meet correctly. Teeth are straightened with orthodontics and corrective jaw surgery repositions a misaligned jaw. This not only improves facial appearance, but also ensures that teeth meet correctly and function properly. People who can benefit from orthognathic surgery include those with an improper bite or jaws that are positioned incorrectly. Jaw growth is a gradual process and in some instances, the upper and lower jaws may grow at different rates. The result can be a host of problems that can affect chewing function, speech, long-term oral health and appearance. Defects in jaw size or position may contribute to sleep apnea, a dangerous condition. Injury to the jaw and birth defects can also affect jaw alignment. Orthodontics alone can correct bite problems when only the teeth are involved. 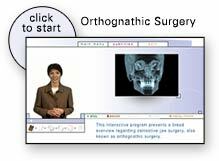 Orthognathic surgery may be required for the jaws when repositioning is necessary.